I’ve been playing around with the excellent zotero Firefox extension lately. 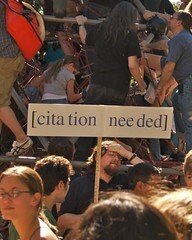 Which has me thinking about my sources and what is the proper way to cite them. Because I work with Open Source software every day I’m very conscious about giving credit for the work of others. Especially ever since I learned about the Creative Commons. I’ve been doing a bunch of research at work lately, and even though I’m only posting it on internal wiki pages I wanted to make sure I was doing things correctly. I’d hate for something like this to happen to me. Whenever I need to learn how to do something properly I go look at what the “pros” are doing. So when I asked myself “What is the correct way to cite sources on a wiki page?” I went straight to the biggest wiki in the world. I knew they’d most likely have already tackled this question, and already had a policy to address it. I wasn’t disappointed. The first thing I found was a new link in the toolbox section of the left column. Its been there for years, I just hadn’t noticed it before. 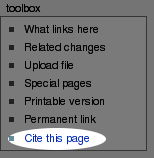 “Wikipedia – Cite this page” which takes me to a page that I guarantee will save many a school student’s paper grade. At the very top is a disclaimer warning that tertiary sources, such as encyclopedia articles and Wikipedia pages, aren’t considered as acceptable sources by most teachers. The Bibliographic details of the article are listed next. zotero detects these and imports them with a single click. Finally, ready for cutting and pasting, is the proper formating of the bibliography entry of the article for eight of the major style guides, BibTeX, and LaTeX. Now that’s helpful! Oh, by the way, I did find what I was looking for. There’s extensive information on the proper way to cite sources. There’s a beginners guide, citation templates, examples, and much more. While there isn’t a set standard it apears the most popular method is to use APA style entries in the contents of footnotes. Wikipedia gets better and better on every visit! Its an excellent research tool as a jumping off point, and I learn so much every time. Just be very carful to stay on topic or this might happen.